As I mention here and there, I don’t think facts are always that important. Facts can lead us into an obsession with detail, a problem many Filipinos have. Or they can be outright lies. Rather, it is ideas that count. Different ways of looking at problems, figuring things out, extending a few “what ifs” into the future and hanging some probabilities on them. Thinking in a structured way, but without self-imposed limits. Getting outside the box. Developing a fresh perspective. So, in that vein, more for my own amusement than anything, I hauled out my Microsoft One-drive cloud-based excel worksheet and drew up a list of possible presidential candidates and how I thought people might look at them. Now whether “how people look at them” is factual or not is irrelevant. People go by what they see, which may only be a shade of the real person. So this evaluation does not rate the candidates per se, but guesses at how the VOTERS, far and wide, rich and poor, see them. The ratings end up being subjective as there are few truly distinguishing acts that separate people. Really KNOWING the facts is difficult. Voters don’t really care about that kind of rigor. So our ideologically pure exercise flamed out. But the fundamental criteria are good, so I used them for my first four traits. Then I added two additional . . . ummmm . . . personality traits, for as we know, politics in the Philippines is NOT based on platform or deeds, but on star power. It is based on the imagined halos on the head of innocents like Poe, or on gold stars pinned to the uniform lapel of political warriors like Binay. Then I spent five minutes discerning the future of the Philippines. I’m happy to say the future is good. Now, Senator Santiago is a crackerjack woman, and I am sorry about her illness. But I hope she does not let her substantial sense of rectitude outweigh the promise that is represented by Senator Poe. The Philippines needs a healthy president to endure the nation’s taxing agenda and culture of criticism. Senator Poe has what it takes to win, above Binay, far above Roxas who has back-runner written all over his campaign. I suspect that President Aquino pinning a gold star on his lapel won’t work because the star is made of political paper with crayon coloring. And the people may be ignorant, but they aren’t stupid. Now five minutes is not a great deal of time to spend deciding on the future of the Philippines, but I figure it is about five times more rigorous than what voters spend. After all, they mostly look for information that confirms their first guess, a guess that becomes passionate as they grow committed to defending it. Because of that, I’d recommend that candidate Poe get out of the gate soon, so she can shape the initial impressions before her opponents try to redefine her. How does my rigorous five-minute assessment stack up against YOUR view of how the people are likely to look at candidates? Jejomar Binay is by far the most popular presidential candidate, with Poe a distant second. MANILA, Philippines — Senate Majority Leader Alan Peter Cayetano on Friday said he could no longer wait to lead the country as he rejected anew the idea of sliding down to vice president. “Hindi (No),” was Cayetano’s quick response when asked by reporters if he would consider running for vice president in 2016. “As I said, madasalin akong tao at ang problema sa mga vice presidents e, isa lang ang dinadasal nila e. At ayokong ipagdasal yun,” he said. But look at the Marcoses from the time Imelda made the pronouncements on reclaiming Malacanang. She has been invited as a guest of honor by the elite Ateneo school. So, thay maybe the start of their coming into the consciousness of the Filipino electorate who have no idea at all about martial law and do not know about life under the Marcos regime. So, should you not factor Bongbong Marcos in your list now? Perhaps we wait for the President’s SONA and see if the PDAF ongoing investigation / trial offset the DAP’s legal issue. unless we have Raissa’s dream team subjects…. Santiago & PNoy for VP. The “character” is by reputation of his father, as the youth will quickly become educated by those who remember. Leyte/Samar will, of course, register very different numbers. He is a very long, long shot, and the best outcome is that some of the stolen money will get plowed into the economy as he runs a fruitless campaign. If he wins I’ll quit blogging. I won’t if Binay wins. You have to wonder how much more quick educating the youth need to become fully “educated by those who remember”. This is the same youth who were bombarded by the declaration that Marcos is evil par excellence from as far back in they childhood as they could remember. Who do you think had full control of media and textbooks since 1986? So it must be truly grating indeed that after nearly 30 years of saturating the air with “truth”, the youth would still think positively of this “evil” person. Heck, they must all be sent to a re-training camp! don’t you think? Whatever went wrong, has it ever occurred to you, Joeam? I think few amongst us are really evil. Misguided, yes, evil, no. I actually don’t have a good feel for the youth of the Philippines. In America, social change is usually led by the youth. Here, they seem preoccupied, or obedient. That, perhaps, is what is wrong. The scoring suggest accuracy and relevance but the scoring is very dependent on the perspective and intention of the one who scores. Trying to identify a hypothetical dream candidate or trying to assess electability? Not all categories are equally important in my book, weighing factors for each category might be applied, but they depend on the perspective and intention. For my dream candidate character would be up most important, popularity and style much less. For electability we have to realize that there are different fishing ponds, class 4 and 5 being much larger than the other ones. Scoring from their perspective and weighing the categories might be totally different. I miss the trait “Access to endorsers”, financially and/or politically. To direct endorsers as celebrities and to indirect indorsers as the local “big men”. “Access to endorsers” would be a good addition. I’d give Binay, Poe and Roxas a “9”, and most of the others a 6 or 7. Binay is connected in the business community and with mayors and governors. Poe was well-funded for her senate campaign and would presumably get a lot of “star” endorsements. Roxas would get the President’s endorsement and a lot of support from the business community. What I find interesting is the character weighting (first column) cast against the popularity rating (last column). The first column is key to reaching the “thinking class” (such as yourself, heh heh) and the last to the masa, the big pond. Poe gathers from both. QED (quod erat demonstrandum or what had to be proofed), the scoring indicates more on who filled it out and for what purpose than it guides or predict voting intentions. The purpose of the guy filling it out is to provoke discussion about how to choose a good president, and to explain why he sees Grace Poe as a stronger candidate than others. Anyone is entitled to rejig the numbers as they see fit and argue the particulars. Or be apathetic, that is okay, too. Miriam appears to be an intelligent choice. She has her faults but compared to others on the list, they won’t matter that much. The voters’ ambivalence will be influenced by the seriousness of her illness. Aquino, this time as VP bet, may balance that off. Poe is greatly admired. Name recall and her polite demeanor and good resume speaks well of her. She is, however, inexperienced. A good second choice, though. Binay rode partly on Estrada’s mass appeal during the previous presidential election. Maybe this is why he may choose Jinggoy Estrada for VP because their family’s campaign value. The others can just wait for their appropriate time, if ever. Ah, interesting point about the Estrada/Binay connection. Binay is for sure in tight with a lot of powerful people, and that will be a force during the election. The one person on the list that I could see as President would be Senator Trillanes, but that would be after he is older and wiser and calmer and less intense. He thinks very very well, out of the box, with good sense. His legislative initiatives reflect that. I don’t see any of the others ever rising to the top position. The people out there rated Binay highest with Grace coming in a far second. Let’s see what they say this quarter. I think the most meaningful statistic comes from measuring awareness levels (how well known is a candidate) and conversion rates (will awareness become votes?) This is a statistic I will track if I am a campaign worker because it will tell me if my ads and sorties are raising my level of awareness among voters and then if my message is getting across and pulling them over to my camp. Yes, that is the best measure, agreed. Formal surveys can indeed measure the propensity to vote if done right. I’m sure that some of the aspiring candidates are conducting their private surveys to get a readout. Grace Poe has not really done anything to get on the front pages. Binay gets there frequently. There is an old advertising adage that says even bad news is good for your product because it gets past the clutter and builds name recognition. I’d guess that is even more true in the ever-forgiving Philippines. So when Binay sits down to dinner with the Chinese ambassador, it doesn’t matter if that is good or bad. Only that it gives him a certain standing. True. 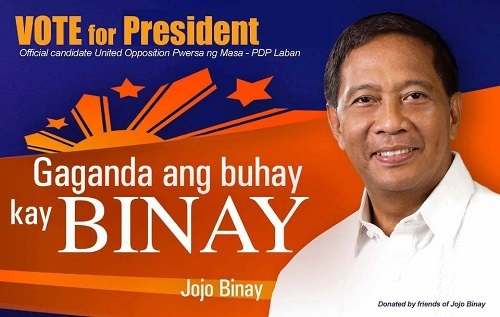 Binay is a politician of the traditional mold. He makes it a point to be in front of voters’ eyeballs no matter what, where or when. He may also have people in the ad business working for him. No surprise here. However, he has political baggage as well and some come in the form of charges of corruption while in office as city executive. Most of them are still unresolved and knowing Phil. politics, these are ammo for his detractors. Include an amorous misadventure (to which he admitted) and the fun begins. Grace Poe seems to be really inexperienced in political brawls. She may use this to her advantage in the sense that Filipinos love underdogs. Cory did admit political inexperience, bravely admitting she has no experience in political corruption, at one point and this, for a time, resonated well. But these are different times now for politics. It’s all about reach and getting your message across. Logistics. Means money. A lot of it. Thanks, vernon. Nice assessment. The chess match has already begun, I think, and it will be a world class election. Fun, indeed. I wonder if COMELEC is ready. Very nice tabulation which gives clear guidance and not conjecture, but i have some comments. Intelligence and Skills is the same, should be rename as Management, add a column for Quality Assurance. When one is intelligent, his/her skills are above average, bringing solution to the problem even is very short time. Does not pressure by schedule dates but provides solution is a gentle manner. very awkward future problems that may become a point for impeachment or termination of contract. is trying to blackmail PNOY for freedom of the outlaws or making an scenarion for impeachment. determine the current remarks of voters. Very interesting ideas, Mac. The Management category is excellent, a combination of intelligence and skill and maybe also something called focus or determination. I believe Binay excels at this and Poe is unproven. Quality assurance would be hard to get a handle on, although I agree it is important, but maybe is a part of management as the focus I am referring to. Perhaps we could call it “Diligence”. The impeachment discussion illustrates to me just how hard it is to be a president in a democracy with an open press, because if you try hard (DAP), you get penalized. In a dictatorship, no problem. The President’s ratings are falling and I think that is unfortunate, but it’s what the process generates. To me, the impeachment complaint is frivolous and destructive, a soft coup. I’d like to see counter-charges filed, but have no idea what they would be. Not by the President, but by a voter’s group. Their electoral choice is being undermined for frivolous reasons. It has been known that with the voters, any candidates who buy their votes, always take their man/ men to the winning table, whether popular or not popular. It is also a plus factor to the candidates if they were famous / celebrities / sportsman. No matter what yardstick one used to measure the voting standards of the bobotante who belong to from below poverty up to lower middle class (majority of the voters), it boils down to how much they are paid which they use to buy their basic needs in particular, the food. They have money for two/ three days, but they starve for the rest of the 6 years. Then they blame everyone else for their starvation and sufferings except themselves. Binay’s political machinery in vote buying is unbeatable, that’s why Nancy won the senatorial election, but very hard to prove, no evidence. If the subjects of vote buying can take pictures, like with spy camera, Binay’s vote buyers are indeed caught in the act then it’s the end of Binay. “They blame everyone else . . . except themselves.” Put that together with all the blames and excuses emanating from the people of authority and we have a pretty blameless . . . and ineffectual nation. How does one instill a sense of personal accountability across a nation that exhibits precious little. I think there is a blog topic in that one, but right now I am drawing blanks as to how to do that. I agree that Binay’s on-the-ground force is amazing. That’s why I think any candidate but Poe would fail against him. So I back the unproven humble girl and figure she has the brains and character to grow very, very fast on the job. She was a main sponsor of RH, I know, and her sharpness of tongue is sometimes the only ethics the Senate possesses. I’d have to do more research to fine tune that rating. I agree! Poe should run and start preparing now. She soft pedals it, saying “well, I don’t have that kind of money”. But that is why she needs to start now. To hire someone to go out and raise that kind of money. In a way, she “self-selects” whether she has what it takes to be president. If she can’t raise money, she doesn’t have the management capability to be president. I think the “no money” excuse is just a bit of smokescreen. Give her a month or two. I’m betting she will run. Wonderful quote. I’m guessing Senator Poe will run. It’s latched into her brain now, and walking away from it would take amazing strength and denial of opportunity. She probably has the strength but the opportunity may only come once. BINAY will have his last laugh if MAR is pitted against him the 2nd time around. Of course BINAY wouldn’t say he’s afraid of losing to Grace Poe. His rather confident feeling of 2016 Presidential Election outcome has significantly diminished by the new development that POE, although not ready enough but already accepted the reality of running for President should fate push her hard enough in that situation. Yes, Poe & Escudero would be a very good team for the Philippines. I agree. And you are right, Mr. Binay cannot say publicly, “oh, oh, we are in trouble now!” He will get his staff working to offset the Poe/Escudero strengths and focus on the weaknesses. It would be a fascinating campaign. Roxas out there would be a snorer, I think. So you must include ratings for Escudero as well. I’m not sure he has what it takes to get the job done (be elected, that is) but he certainly has the ambition. Character has to do with values, good or bad, and personal deportment: considerate, earnest, determined, courageous, having integrity. A person of bad values can achieve good ends if the setting is right and he is not caught breaking the law. Vice President Binay’s “5” on character was because I believe half the voting population thinks he is corrupt while the other half likes his style. But without question, Makati is shiny and rich.